Boozy brits are drinking more and more before flights even though airlines are trying to clamp down. “Get as many in as you can” seems to be the mantra of the UK holiday maker says car hire firm CheapCar.co.uk who carried out a survey of holiday makers. Travellers from popular UK airports to popular holiday locations such as Tenerife, Spain and Ibiza were questioned in October 2017. The results of the CheapCar.co.uk survey showed that 7% of those asked were drinking 5 or more pints and 15% drinking 3-4 pints (or equivalent) before boarding their plane. The trend of “pre-drinks” where you get drunk before going out to get drunk seems to be the norm for those going on holiday too. Ryanair has called on airports to limit drinks to two per person, but the challenge is how the airports actually police this. 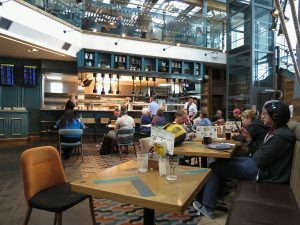 However, airports make good profit from the bar areas in airports with many airports investing heavily in creating new spaces for travellers to enjoy themselves pre-flight. The popularity of “pre-drinks” before flying could be very difficult to clamp down on. People are used to drinking before going to the races, nightclubs or other events. The popularity of all-inclusive and free drinks in bars on holiday mean that holidaymakers are simply reacting to what they are used to. “Or maybe they are just starting their holiday fun early by having a few drinks.